Philo (20 B.C.E. – 50 C.E. ), known also as Philo of Alexandria and as Philo Judaeus, was a Hellenized Jewish philosopher who synthesized Stoic, Platonic and Jewish ideas and laid a philosophical and theological foundation for the development of Christianity in the West and the East and, indirectly, for rational theologians in the Jewish and Islamic worlds. He developed concepts later used in the interpretations of Clement of Alexandria, Athenagoras, Theophilus, Justin Martyr, Tertullian and Origen. It is thought that he may have influenced Paul and the authors of the Gospel of John and the Epistle to the Hebrews. Philo wrote commentaries portraying the Hebrew Bible as an allegory for the rise and fall of the human soul. He developed the concept of Logos to mean the Divine Mind, the Platonic Form of Forms, the Idea of Ideas; the pattern according to which the corporeal universe was fashioned. He believed that the highest perception of truth is possible only after a study of the encyclopedic sciences, and that education is one of the means of elevating the spirit of man. Philo regarded Moses as a great philosopher and used philosophy to defend and justify religious truths. He was ignored by the Jewish tradition, which emphasized theology over philosophical speculations. His works were preserved by the Christian church, primarily because some early Christians perceived him as a Christian. Eusebius speculated that the Therapeutae, the Jewish group of ascetic hermits in the Egyptian desert that Philo describes in De vita contemplativa ("Contemplative Life") was in fact a Christian group. Little information is available about the life of Philo, except for a few biographical details in his own works, especially in Legatio ad Caium, ("Embassy to Caius"), and a brief mention of him in the Antiquities of Flavius Josephus. He was born about 25 B.C.E. in Alexandria, which at that time was home to the largest Jewish community outside of Palestine. He was part of a prominent family; his brother Alexander Lysimachus was a wealthy official of the Roman government, who donated money to plate the gates of the Temple of Jerusalem with gold and silver, and made a loan to Herod Agrippa I, grandson of Herod the Great. One of Alexander’s sons married a daughter of Herod Agrippa I, and his other son abandoned the Jewish faith and became procurator of Judea and prefect of Egypt. Philo mentions that he once visited Jerusalem. From Philo’s works it is clear that he had a thorough knowledge of Greek and of the theories of the Stoics, Plato’s dialogues, and neo-Pythagorean writings. He believed that the highest perception of truth is possible only after a study of the encyclopedic sciences. It is apparent that he used a Greek translation of the Jewish scriptures rather than Hebrew manuscripts. His Allegorical Commentary indicates that he was deeply involved in the Jewish community. The most documented episode of his life is his participation in a Jewish delegation which traveled to Rome in 39 C.E. to complain to the emperor, Caligula, about the persecution of the Jews in Alexandria by the governor, Flaccus. Are you making war upon us, because you anticipate that we will not endure such indignity, but that we will fight on behalf of our laws, and die in defense of our national customs? For you cannot possibly have been ignorant of what was likely to result from your attempt to introduce these innovations respecting our temple. His presentation supports the Jewish commitment to rebel against the emperor rather than allow such sacrilege to take place. Philo’s work Against Flaccus, gives a valuable account of the plight of the Jews in Alexandria under Emperor Caligula and Flaccus, the Roman governor of Alexandria. Philo relates that Flaccus permitted a Greek mob to erect statues of the emperor in Jewish synagogues of Alexandria, an unprecedented provocation. This invasion of the synagogues was perhaps resisted by force, since Philo then says that Flaccus "was destroying the synagogues, and not leaving even their name." In response, Philo says that Flaccus "issued a notice in which he called us all foreigners and aliens... allowing any one who was inclined to proceed to exterminate the Jews as prisoners of war." The mobs "drove the Jews entirely out of four quarters, and crammed them all into a very small portion of one ... while the populace, overrunning their desolate houses, turned to plunder, and divided the booty among themselves as if they had obtained it in war." 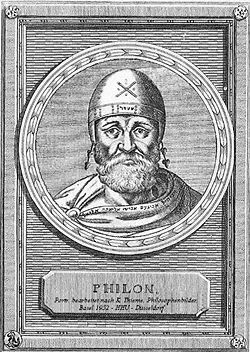 Philo says their enemies, "slew them and thousands of others with all kinds of agony and tortures, and newly invented cruelties, for wherever they met with or caught sight of a Jew, they stoned him, or beat him with sticks…the most merciless of all their persecutors in some instances burnt whole families, husbands with their wives, and infant children with their parents, in the middle of the city, sparing neither age nor youth, nor the innocent helplessness of infants." Some men, he says, were dragged to death, while "those who did these things, mimicked the sufferers, like people employed in the representation of theatrical farces." Other Jews were crucified. Flaccus was eventually removed from office and exiled, ultimately suffering the punishment of death. Philo wrote mostly philosophical essays on the main themes of Biblical thought. He regarded Moses as a great philosopher, and attempted to show how Platonic or Stoic ideas resembled deductions made from the Biblical verses of Moses. He was not the first to attempt to reconcile Greek thought with Hebrew tradition; philosophers such as Aristobulus and Pseudo-Aristeas had preceded him. He was, however, the most successful and the most influential to do so. His work was not widely accepted by his contemporaries. "The sophists of literalness," as he calls them (De Somniis, i. 16-17), "opened their eyes superciliously" when he explained to them the marvels of his exegesis. On Abraham, On the Decalogue, On Joseph, The Life of Moses, On the Creation of the World, On Rewards and Punishments, On the Special Laws, On the Virtues. A series of works include allegorical explanations of Genesis 2-41: On Husbandry, On the Cherubim, On the Confusion of Tongues, On the Preliminary Studies, The Worse Attacks the Better, On Drunkenness, On Flight and Finding, On the Giants, Allegorical Interpretation (Allegory of the Law), On the Migration of Abraham, On the Change of Names, On Noah's Work as a Planter, On the Posterity and Exile of Cain, Who is the Heir, On the Unchangeableness of God, On the Sacrifices of Abel and Cain, On Sobriety, On Dreams. Here belong also: Questions and Answers on Genesis and Questions and Answers on Exodus. Every Good Man is Free (a sequel of which had the theme that every bad man is a slave, which did not survive); On the Eternity of the World; On Providence: Alexander or On Whether Brute Animals Possess Reason (preserved only in Armenian) and called in Latin De Animalibus (On the Animals); a brief fragment De Deo (On God), preserved only in Armenian, is an exegesis of Genesis 18, and belongs to the Allegory of the Law. Hypothetica or Apologia Pro Judaeos, which survives only in two Greek extracts quoted by Eusebius. Hypothetica is a rationalistic version of Exodus contrasting the severity of the Mosaic law with the laxity of the gentile laws. Apologia Pro Judaeos describes the Essenes. The other apologetic essays include Against Flaccus, The Embassy to Gaius, and On the Contemplative Life, which describes the life of the monastic ascetic group of Therapeutae and Therapeutrides. All of these works relate to Philo's explanations of the texts of Moses. Philo’s works are the most important surviving documents of Hellenistic Judaism. In addition to being philosophical treatises, they furnish a great deal of historical information about the Alexandrian Jewish community and the interactions between the Jews and the Roman government. Philo used philosophy to defend and justify Jewish religious truths. He regarded these truths as fixed and determinate; philosophy was a means of arriving at truth and an aid to understanding it. Philo rejected certain philosophical tenets of the Greeks which did not harmonize with the Jewish religion, such as the Aristotelian doctrine of the eternity and indestructibility of the world. Philo regarded the Bible as not only as a religious revelation, but as a source of philosophic truth; according to him, Greek philosophers such as Heraclitus (Rerum Divinarum Heres Sit," §43, i. 503), Zeno (Quod Omnis Probus Liber, §8, ii. 454), Lycurgus, and Hesiod had also borrowed from the Bible. Greek philosophy seemed a natural development of the revelatory teachings of Moses. Philo based his doctrines on the Hebrew Bible, which he considered the source and standard not only of religious, but of all truth. He considered its pronouncements to be divine pronouncements. They were the words uttered sometimes directly and sometimes through the mouth of a prophet, especially through Moses. Philo viewed Moses the real medium of revelation, while the other writers of the Hebrew Bible appeared as friends or pupils of Moses. Although he distinguished between the words uttered by God, as the Decalogue, and the edicts of Moses, as the special laws; he believed that everything in the Torah was of divine origin, even the letters and accents. The Hebrew Bible had not been canonized at the time of Philo, and the extent of his knowledge of Biblical books cannot be exactly determined. Philo does not quote Ezekiel, Daniel, Ruth, Lamentations, Ecclesiastes, or Esther. Philo, like other Jewish allegorists who preceded him, sought the hidden meaning of traditional texts in the Hebrew Bible and used symbolism to uncover truths which he related to later philosophical ideas. He used philosophy to interpret the Jewish scriptures in the same way that Stoic allegorists found philosophical meaning in the works of Homer. In some aspects of Jewish life, such as circumcision and observance of the Sabbath, Philo defended a literal interpretation of the scriptures, though he acknowledged the symbolic meaning of these rituals. Philo based his hermeneutics on the assumption of a twofold meaning in the Bible, the literal and the allegorical. A special method was requisite for determining the real meaning of the words of scripture; the correct application of this method determined the correct allegory, and was therefore called "the wise architect" (De Somniis, ii. 2 [i. 660]). According to these rules of interpretation the literal sense of certain passages of the Bible had to be excluded altogether, such as the passages in which, according to a literal interpretation, something unworthy is said of God; or in which statements are made that are unworthy of the Bible, senseless, contradictory, or inadmissible; or in which allegorical expressions are used for the avowed purpose of drawing the reader's attention to the fact that the literal sense is to be disregarded. Philo developed special guidelines to help the reader to recognize the passages which demanded an allegorical interpretation, and to help the initiated find the correct and intended meaning. Passages which contained the doubling of a phrase; an apparently superfluous expression in the text; the repetition of statements previously made; or a change of phraseology, indicated something special that the reader must consider. An entirely different meaning might also be found by disregarding the ordinarily accepted division of a sentence into phrases and clauses, and forming a different combination of the words. Synonyms required careful study; for example, why λαὸς was used in one passage and γένος in another. A play upon words might be utilized to uncover a deeper meaning; e.g., sheep (πρόβατον) stand for progress in knowledge, since they derive their name from the fact of their progressing (προβαίνειν). A definite allegorical sense could be gathered from certain particles, adverbs, and prepositions; and in certain cases it could be gathered even from the parts of a word; such as from διά in διάλευκος. Every word must be explained in all its meanings in order that different interpretations might be found. A skillful interpreter might make slight changes in a word, following the rabbinical rule, "Read not this way, but that way." Philo, therefore, changed accents, and breathings in Greek words. Any peculiarity in a phrase justified the assumption that some special meaning was intended: for example, where μία ("one") is used instead of πρώτη ("first"). Details regarding the forms of words were very important: number and gender; whether the word showed any peculiarity in the singular or the plural: verb tense; or the presence or omission of an article. Other clues to deeper meaning were the artificial interpretation of a single expression; the position of the verses of a passage; peculiar verse-combinations; noteworthy omissions; striking statements; and numeral symbolism. Philo analyzed the usage of numbers of the Bible, and believed that certain numbers symbolized different ideas. Number one is God's number, and the basis for all numbers (De Allegoriis Legum, ii. 12 [i. 66]). Number two is the number of schism, of that which has been created, of death ("De Opificio Mundi, § 9 [i. 7]; De Allegoriis Legum, i. 2 [i. 44]; De Somaniis, ii. 10 [i. 688]). Three is the number of the body (De Allegoriis Legum, i. 2 [i. 44]) or of the Divine Being in connection with His fundamental powers (De Sacrificiis Abelis et Caini, § 15 [i. 173]). Four is potentially what the number ten actually is, the perfect number (De Opificio Mundi, §§ 15, 16 [i. 10, 11], etc. ); but in an evil sense four is the number of the passions, πάθη (De Congressu Quærendæ Eruditionis Gratia. § 17 [i. 532]). Five is the number of the senses and of sensibility (De Opificio Mundi, § 20 [i. 14], etc.). Six, the product of the masculine and feminine numbers 3 × 2 and in its parts equal to 3+3, is the symbol of the movement of organic beings (De Allegoriis Legum, i. 2 [i. 44]). Seven has the most various and marvelous attributes (De Opiticio Mundi, §§ 30-43 [i. 21 et seq.]). Eight, the number of the cube, has many of the attributes determined by the Pythagoreans (Quæstiones in Genesin, iii. 49 [i. 223, Aucher]). Nine is the number of strife, according to Genesis 14. (De Congressu Qu. Eruditionis Gratia, § 17 [i. 532]). Ten is the number of perfection (De Plantatione Noë, § 29 [i. 347]). Philo also attributed special significance to the numbers 50, 70, and 100, 12, and 120. The term logos was widely used in the ancient Hellenistic world. The Stoics conceived of logos as the bond between different parts of the world, and the Heracliteans used logos to refer to the source of the cosmic oppositions. In Jewish literature logos referred to the words of the prophets, or the utterances of God as presented in the scriptures. Philo synthesized these concepts and used the term logos to mean “the Divine Mind,” the “Platonic Form of Forms,” the “Idea of Ideas,” or the sum total of “Forms or Ideas,” the pattern according to which the corporeal universe was fashioned. By its inherent nature, preexistent, unformed matter could not come into direct contact with the divine; logos was in an intermediary position between the very essence of God and the substance of the corporeal world. In an interpretation of the symbolism of the garment of the high priest in Exodus 28:34 and 36, Philo states: "But the seal is an Idea of Ideas, according to which God fashioned the world, being an incorporeal Idea, comprehensible only by the intellect" (Mig. 103). "The incorporeal world then was already completed, having its seat in the Divine Logos and the world, perceptible by the external senses, was made on the model of it" (Op. 36). Describing Moses' account of the creation of man, Philo claims also that Moses calls the invisible Divine Logos the Image of God (Op. 24; 31; LA 1.9). Philo also referred to logos as the “first-born” of God, meaning that it was the first thought proceeding from the mind of God. Some scholars believe that the concept of the Logos referred to in the prologue to the Gospel of John was influenced directly by Philonic teachings. Others believe that early Christian writers confounded the logos of John with the logos of Philo, but that the two concepts differ and were simply drawn from a common Jewish background. Philo rejected the Aristotelian conclusion that the world existed from eternity without any creative act: "For some men, admiring the world itself rather than the Creator of the world, have represented it as existing without any maker, and eternal, and as impiously and falsely have represented God as existing in a state of complete inactivity" (Op. 7). Philo’s explanation of the Creation is based on the book of Genesis in the Bible. On the grounds that no praise is given to matter in Genesis, Philo conceives of matter as evil and therefore incapable of direct contact with the divine (Quis Rerum Divinarum Heres Sit, §32 [i. 495]). As a result, he does not support Creation ex nihilo, but as a strict monist, he also could not accept God’s formation of the world from pre-existent matter, as Plato did. The instrument of creation is logos, which shapes formless matter into intelligible beings. Philo compares God to an architect or gardener, who formed the present world (the κόσμος ἀισϑητός) according to a pattern, the ideal world (κόσμος νοητός). Philo made a modification to the Platonic doctrine of forms and elaborated a theory of “eternal creation,” that God did not begin to create the world at a specific moment in time, but is "eternally applying Himself to its creation" (Prov. 1.7; Op. 7; Aet. 83-84). "For God while he spake the word, did at the same moment create; nor did he allow anything to come between the Logos and the deed; and if one may advance a doctrine which is pretty nearly true, His Logos is his deed" (Sacr. 65; Mos.1.283). Thus God is eternally and constantly creating the intelligible world of Ideas. Time is a creation of God and exists only in the physical world (a Platonic concept). The creative activity as well as the act of creation takes place outside of time. In that context, formless, shapeless matter never exists because it is instantaneously modified by logos into organized and intelligible being. Philo regards the physical nature of man as being defective and an obstacle to his development, but as an indispensable aspect of the nature of his being. The body has certain physical requirements which sometimes interfere with spiritual progress, yet it is of advantage to the spirit, since the spirit arrives at its knowledge of the world by means of the five senses. The spiritual nature of man, which has priority over the physical body, has a twofold tendency: one toward the sensual and earthly, which Philo calls sensibility (αἴσϑησις), and one toward the spiritual, which he calls reason (νοῦς). Sensibility has its seat in the body, and lives in the senses. Sensibility, however, is in need of being guided by reason. Reason is that part of the spirit which looks toward heavenly things. It is the highest, the real divine gift that has been infused into man from without (De Opiticio Mundi, i. 15; De Eo Quod Deterius Potiori Insidiatur, i. 206). The νοῦς is originally at rest; when it begins to move it produces the several phenomena of mind (ἔνϑυμήματα). The principal powers of the νοῦς are judgment, memory, and language. The physical body is a source of danger, as it easily drags the spirit into the bonds of sensibility. Sensibility is the source of the passions and desires; passions attack the sensibility in order to destroy the whole soul. According to Philo, man passes through several steps in his ethical development. At first the several elements of the human being are in a state of latency, a kind of moral neutrality which Philo designates by the terms "naked" or "medial." The soul has not decided either for sin or for virtue. In this period of moral indecision God endeavors to present to it, in the "earthly wisdom and virtue," an image of heavenly wisdom. Man quickly leaves this state of neutrality as soon as he experiences desire, and passion ensnares him in the bonds of sensibility. Here the moral duties of man arise and he must navigate between two opposite tendencies. Philo interpreted the Jewish scriptures as an allegorical account of the rise and fall of the human soul. The soul was first aroused by the stimuli of sensual pleasures, became devoted to the body, and began to lead an intolerable life (βίος ἄβίωτος), inflamed and excited by irrational impulses. Its condition was restless and painful; a continual inner void produced a lasting desire which was never satisfied. All the higher aspirations after God and virtue were stilled, the entire soul was corrupt and ignorant, and the power of judgment was lost. Sensual things were valued above spiritual; and wealth was regarded as the highest good. Man in his folly even opposed God, and thought to scale heaven and subjugate the entire earth. The biblical patriarch Abraham was regarded by Philo as the symbol of man leaving sensuality to turn to reason (De Migratione Abrahami, § 4 [i. 439]). Philo elaborated three methods by which one can rise toward the divine: through education, through practice (ἄσκησις), and through natural goodness (ὁσιότης). Good moral endowment took precedence over education and practice. Virtue was not the result of hard labor, but was an excellent fruit maturing of itself. The Biblical character Noah represented the preliminary stage. Noah was called by God, apparently because of his good disposition, since no particularly good deeds were reported of him. As Noah was praised only in comparison with his contemporaries, it followed that he was not yet a perfect man. Philo identified several characters in the Scriptures who represented the perfect man, such as the Biblical patriarch Isaac. Perfection was a part of the nature (φύσις) of such persons; their souls were in a state of rest and joy. Philo’s concept of virtue resembled that of the Stoics, but he taught that man could not attain virtue through his own efforts, but only through religion, with the assistance of God. The Garden of Eden was a symbol for "the wisdom of God," the “Logos of God’” and “virtue.” From it proceeded four rivers representing the cardinal virtues of prudence, courage, self-control, and justice (φρόνησις, ἀνδρία, σωφροσύνη, δικαιοσύνη). ↑ Josephus, Antiquities of the Jews, xviii. 8, § 1. Translated by William Whitson. Available online from Project Gutenberg. Retrieved August 29, 2007. ↑ Philo, On the Embassy to Gaius, chap. 28-31. Translated by C. D. Yonge. Available online from EarlyChristianWritings.com. Retrieved August 29, 2007. ↑ Flaccus, chap. 6-9 (43, 53-56, 62, 66, 68, 71-72) Translated by C. D. Yonge. Available online from EarlyChristianWritings.com. Retrieved August 29, 2007. Baer, R. C. Philo's Use of the Categories Male and Female. Leiden: E. J. Brill, 1970. Colson, F. H. and G. H. Whitaker (eds.). The Works of Philo. (Cambridge, MA: Loeb Classical Library, Harvard University Press; London: William Heinemann, 1929-1953), vols. 1-10. Edited by Ralph Marcus; containing works of Philo available only in Armenian. Dillon, John M. The Middle Platonists. Ithaca, NY: Cornell University Press, 1977, 1996. Dodd, C. H., The Interpretation of the Fourth Gospel. Cambridge: Cambridge University Press, 1963. Sandmel, S. Philo of Alexandria: An Introduction. New York/Oxford: Oxford University Press, 1979. Williamson, Ronald. Philo and the Epistle to the Hebrews, Leiden: E. J. Brill, 1970. Wolfson, H. A. Philo. Cambridge, MA: Harvard University Press, 1947, vols 1-2. Yonge, Charles Duke (trans.). The Works of Philo. Complete and Unabridged. Translated, New Updated Edition. Hendrickson Publishers, 1995.